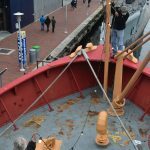 Workday: Historic Ships in Baltimore – November 18, 2017 – Chesapeake Chapter U.S.L.H.S. 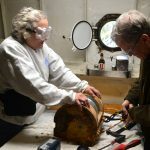 Greg, Paula and Heidi work on range light. It was a busy day on our last workday in Baltimore for 2017. 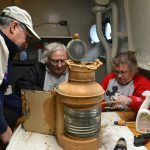 Nine Chapter volunteers gathered on the Lightship Chesapeake on a chilly Saturday in November and got to work on several different tasks. The ladders to the wheel house and fly bridge were removed and the bulkheads were cleaned and vacuumed. This was one of the first tasks since we wanted to complete this before the tourists started showing up. The area behind and under the main ladder was also cleaned – but this thankfully did not require it to be removed. 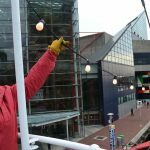 Another task was to replace the burned out bulbs on the string of lights that hangs over the deck in three sections from bow to stern. This is an involved task because the string of lights has to be carefully lowered so that the bulbs don’t smack against any part of the ship. One end of the lights was attached to a line on the mast that contains the range light. 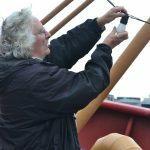 When Rob (who works at the museum) went up the mast to fix the line so the lights could be lowered, it was discovered that the range light had become loose and was in need of some repair. So a new task was born – we needed to clean and disassemble the forward range light that had been removed from the mast. This will take more than one work day as it needs further cleaning. It will then be primed and painted before it is reinstalled. 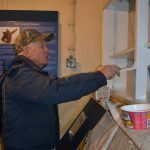 Did I mention painting – well while we weren’t ready to prime or paint the range light, there were other things in need of paint. The painting of the bulkheads in the Cook’s quarters was completed. We’d done one half of the room on a previous workday. The top of the display cabinet was given a second coat of paint. The bottom is, after three coats, thankfully completed. 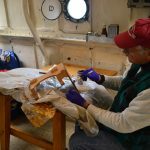 Some of the other work included cleaning the portholes and skylights, hanging some holiday lights (a bit of a tradition for us.) and pulling some of the old electrical wiring. Some of the old wires proved especially stubborn this time, but they were eventually removed. A brass plate was installed on the Fly Bridge Door. Some brackets were given a coat of primer. it was a productive and satisfying final workday for 2017! Paula and Rob work on overhead lights. Heidi pulls light string down so bulbs can be changed. Paula changes bulb on overhead lights. Lauren and Andy clean Range light. Tony primes bracket for front range light. Hobie touches up the display cabinet.